Test out a few different marking tools to see which ones you prefer. 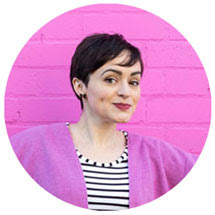 Test them out on your fabric too - different fabrics will respond differently to different markers, so try them out on a small scrap of whichever fabric you're using to check that 1) it shows up enough for you to see it, but 2) it won’t stain the fabric permanently! Washable pens → These pens are cheap and widely available in multi-coloured packs (check the children’s department in stationery shops). They show up well on lots of fabrics and will come out in the first wash (though do check first!). Tracing wheel → Place dressmaker's carbon faced down on your fabric, lay the pattern on top, then use a tracing wheel to trace the lines onto the fabric. Nifty! Hera marker → This little gadget, used a lot in quilting, scratches a little groove into fabric fibres, which will come out in the wash.
Chalk pencil → Usually available in white, blue and pink, chalk pencils are easy to use, and they rub off fairly easily - which is both a pro and a con, depending on which way you look at it. Tailor’s chalk → These chalk triangles have slim edges and are useful for making quick, smooth lines onto fabric and pretending you work on Saville Row. Other options for marking include tailor’s tacks and disappearing ink. 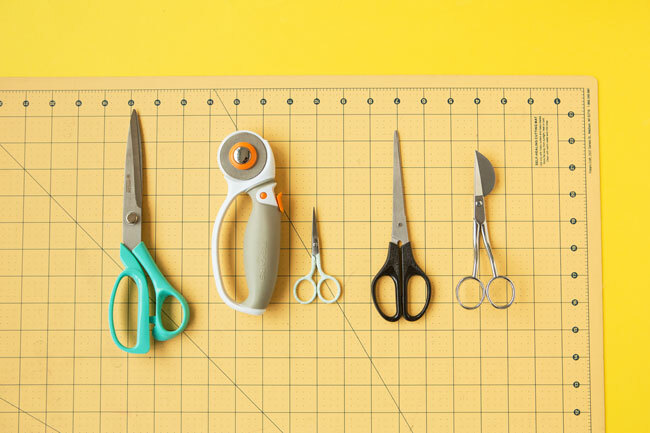 Dressmaking scissors → Invest in a nice, sharp pair of dressmaking scissors which will glide through fabric easily. Keep them away from paper to keep them sharper for longer. Rotary cutter → Optional and a matter of personal preference. A rotary cutter is useful for speedy cutting and for fabric that slips and slides around easily. Watch out for that blade though – ouch! Keep fingers and toes away and keep it closed when not in use. 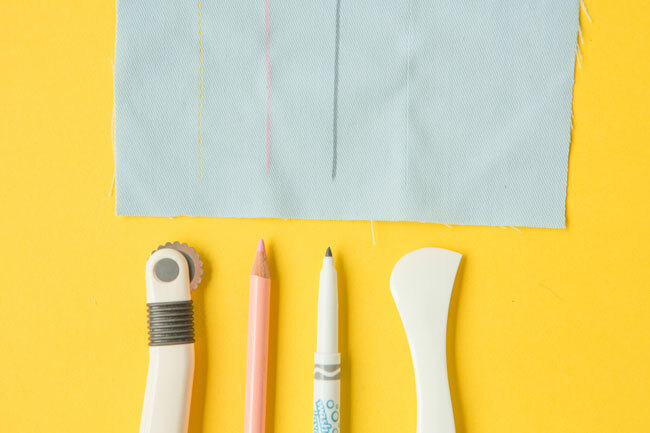 Embroidery scissors or thread snippers → Keep these handy for snipping your threads. Paper scissors → To keep your dressmaking scissors sharp, have some dedicated paper scissors for cutting out your patterns. Pinking shears → Not shown here as I don’t have any, but some people like using pinking shears to cut a zigzag edge on seams for a speedy finish. Cutting mat → A seriously good idea if you don’t want to scratch your kitchen table! 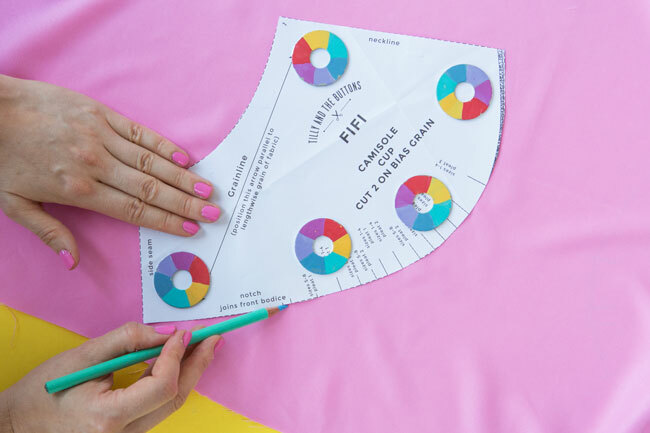 Righto, so now let's talk about how to use these tools to cut out your fabric. The key to accurate cutting is to keep your fabric as flat as possible against the table. Take your time when cutting and use the hand you’re not cutting with to gently hold your fabric in place. Cut the pattern pieces out with paper scissors – either exactly on (or just within) the lines, or leaving some extra paper around the lines. 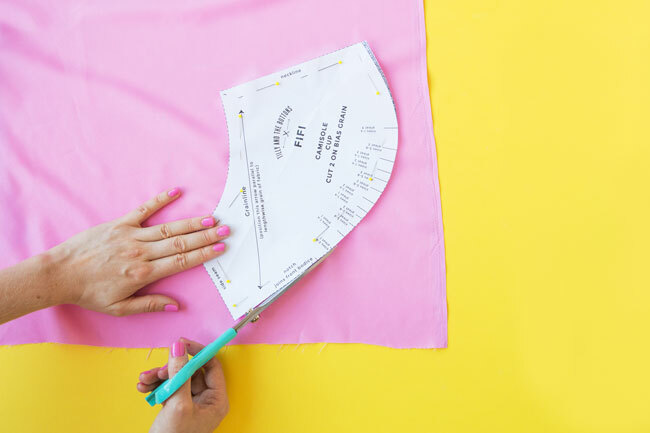 Pin the pattern pieces to the fabric – use enough pins to hold the pattern in place, but not so many that the pins distort the pattern or fabric. Now cut the fabric with dressmaking scissors. If you’ve cut the pattern pieces out roughly, cut directly on the lines through both pattern and fabric. This can dull your fabric scissors though; but on the other hand, it can be more accurate than cutting around a pre-cut pattern. Cut the pattern pieces out with paper scissors precisely on (or just within) the lines. Instead of pinning the pattern pieces in place, this time use weights to hold them in place. The idea is that weights keep the pattern and fabric flatter than the pinning method. You don't have to buy specialist pattern weights - you can use whatever you have around the house, such as food tins. Draw around the pieces with a sharp chalk pencil or washable pen. 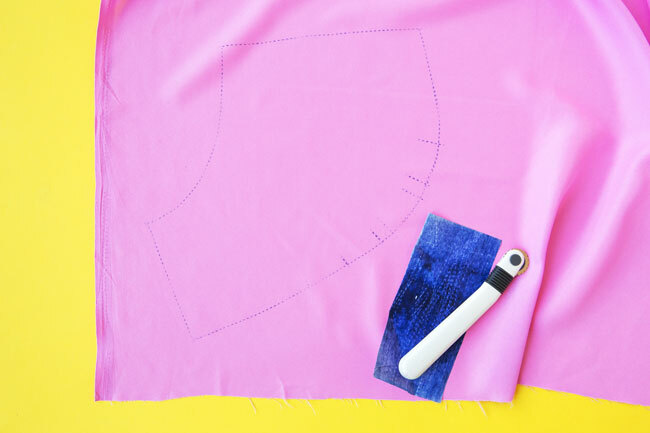 Remove the pattern and use dressmaking scissors or a rotary cutter to cut the fabric just within the pattern lines you've just drawn. This is my favourite way of marking and cutting fabric, particularly when I don't want to cut into my pattern. Hold the pattern pieces down on the fabric with weights. Slip a piece of dressmaker's carbon between the pattern and fabric, face down against the fabric. Trace over the pattern lines using a blunt tracing wheel moving the dressmaker's carbon as you need to. Remove the pattern. Cut out the fabric directly on the traced lines using dressmaking scissors. As well as marking the cutting lines of the pattern, don't forget to mark in the other bits and bobs such as darts, buttonholes and gather points. 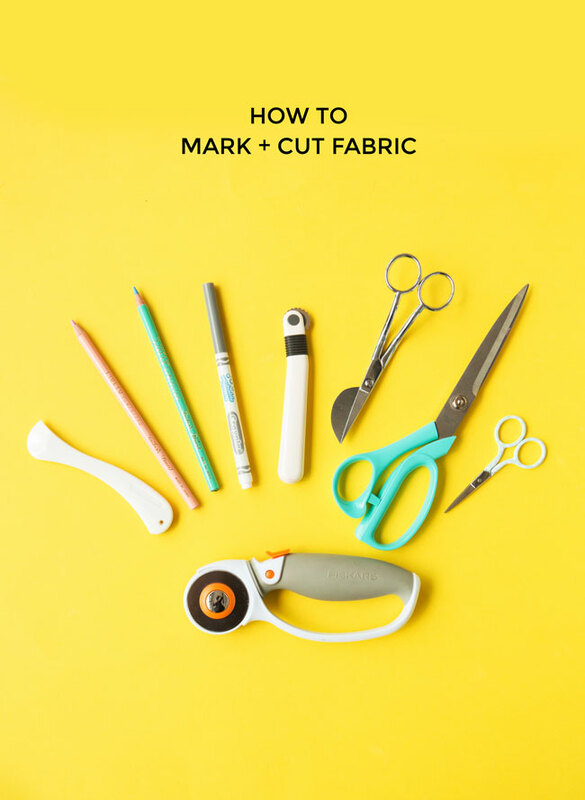 What's your favourite method of marking and cutting fabric? 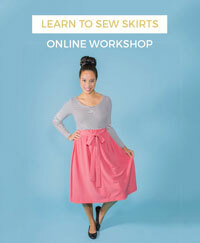 If you'd like some more help getting started with sewing patterns - from cutting through basic clothing construction - try our online video workshop, Learn to Sew Skirts.